Star Wars has had such a profound impact on pop culture that it's no surprise that it has inspired architecture too. These Death Star style buildings are testimony to how much the world loves the Empire — or maybe just how iconic the spherical, shiny structure really is. OK, so many of these buildings were built before Star Wars came out. That just means the Death Star is some kind of universal symbol that lurks in our collective unconscious — right? La Géode, a mirrored dome (118 ft or 36 m in diameter) that holds an IMAX cinema, in Parc de La Villette, Paris, France, designed by Adrien Fainsilber and Gérard Chamayou, opened in 1985. It is composed of 6,433 stainless steel triangles. 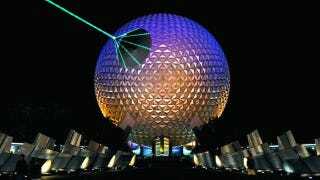 The iconic 18-story geodesic sphere, the Spaceship Earth in Epcot, Walt Disney World Resort, Orlando, Florida, opened in 1982. And it was designed with the help of Ray Bradbury! Kugelhaus, designed by Peter Birkenholz, built in Dresden, Germany, 1928, demolished ten years later. Ericsson Globe, Stockholm, Sweden, the largest hemispherical building in the world, built between 1986 and 1989, designed by Svante Berg and Lars Vretblad. It also represents the Sun in the Sweden Solar System. Tijuana Cultural Center, designed by Manuel Rosen Morrison and Pedro Ramírez Vázquez, Tijuana, Mexico, opened in 1982. It also features an IMAX theatre. The sphere of the Mira Department Store, a part of Core Pacific City (also known as the Living Mall), Taipei, Taiwan, built in 2001, designed by the Jerde Partnership and Artech. The 11-story high sphere is made of granite imported from Finland. The Montreal Biosphère at Parc Jean-Drapeu, Montreal, Canada, designed by Buckminster Fuller as an enclosed pavilion of the United States for the World Fair Expo 67 in 1967. The acrylic bubble burned away in a 1976 fire, then left abandoned until the early 1990s. It reopened as a water museum in 1995. The top image of Spaceship Earth was taken by Tom Arthur, badly Photoshopped by the author.